In Daiso, there are some things that are worth it for $2 and others that are over priced for $2. Nevertheless, I purchased these 5 items for $2 each. I bought the pill remover because I read Cocoa Bee's positive review on it from her blog. This machine gently shaves off the fuzz on your clothing and makes them look brand new. I'm excited to try this on my sweaters, nylon leggings and my work out pants. I think it's totally worth it for $2. I bought a set of two thicker lashes as well. I think the sets of 2 are worth it for $2 but the single pairs for $2 isn't really worth it to me. 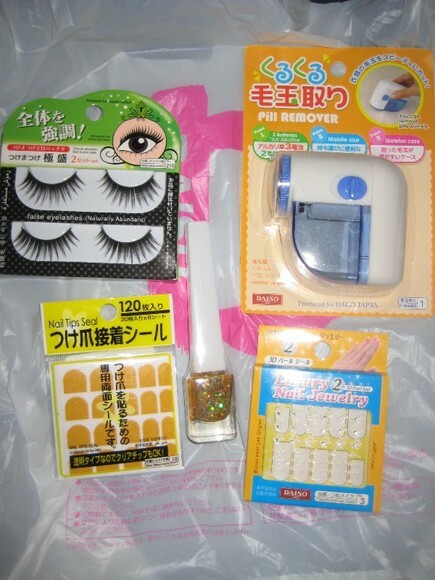 On a side note, the selection for lashes at Daiso improved when I last went. Before they only had "natural" lashes and not much of the dramatic ones. I bought a pair of those "natural" lashes and they hurt to put on and they were too short and sparse. Those lashes looked like my regular lashes. 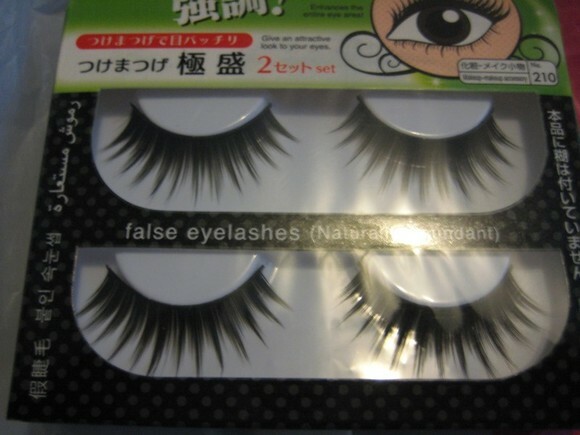 I think they were made for girls with more "asian eyes" - aka short/sparse eyelashes that point downwards. Anyways, I can't wait to try out these thicker lashes out. Finally! They do exist! I found the stickers you stick to your nail and leaves the tip exposed as a guide for the perfect french tip. I blogged about the existence of these on my nail polish collection post. Daiso had a package of 40, 96 or 120 stickers for $2. Obviously I chose the package with 120. I can't wait to try these as well. Now to find the perfect opaque light pink nail polish for my french manicure that doesn't streak - what do you ladies use? Any recommendations? Since I had no luck finding these stickers anywhere else, I think it's a steal for $2. 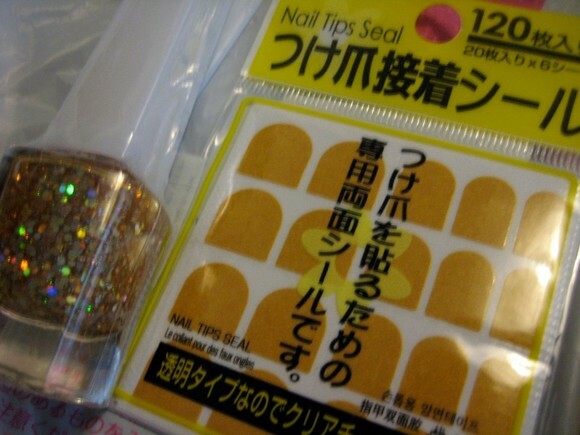 Lastly, I bought nail stickers and a gold shimmer nail polish. These weren't really worth it for $2 but whatever. It was convenient. Daiso has a wide selection of nail stickers. Most of them I found tacky (pink hearts, butterflies, colourful stuff, etc) but these simple white flowers were pretty subtle. However, there is only one sheet of stickers. The gold shimmer nail polish was so pretty. I was looking for one with bigger flecks of sparkles as well. However, the bottle is small at only 10mL (I could have bought a bigger bottle from Forever 21 for $3). Overall, sometimes you pay for convenience and sometimes it's a steal. I'll review these items individually when I have the chance to use them. 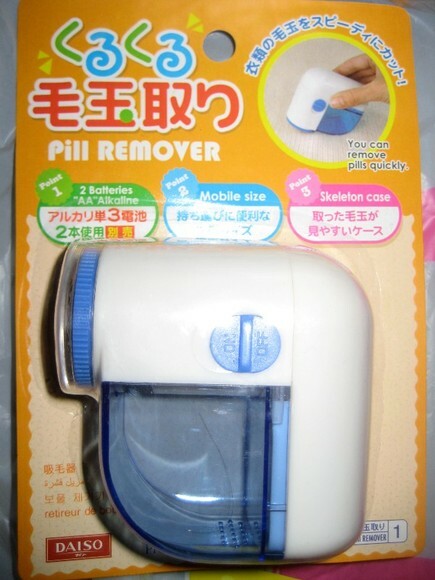 I have a pill remover (not from Daiso but essentially the same) and I could not live without it. I use it on everything! Ooh - I wonder if there's a daiso near where I live! Those pill removers are so handy, I've had one since college, and they're amazing at keeping sweaters looking lint-free and new. Just be careful on finer fabrics - I've had fabric sucked in and left with a tiny hole. Thanks girls for all of your advice. I will try this little device out on my cheapo Mariposa leggings first before I do my work out TNA pants lol. Oh and my Wilfred cashmere/wool coat is in dire need of de-pilling lol. Hey you are right about the tip of the glitter nail polish. It's so thin! At first I was like: "This is inconvenient" but then again, I guess it's good for applying the big flecks of sparkle one by one in the place you want them. I found it took forever to dry! I think I want to get more colours of these glitter polish. I used the gold on my tips and I can't tell if I love it or hate it because the gold makes me look like I have yellowy dirty stained tips in a way? LOL. I'll upload a picture soon. hehehe de-nubblers is such a cute name. I still have to hunt down my AA batteries to use this little machine. 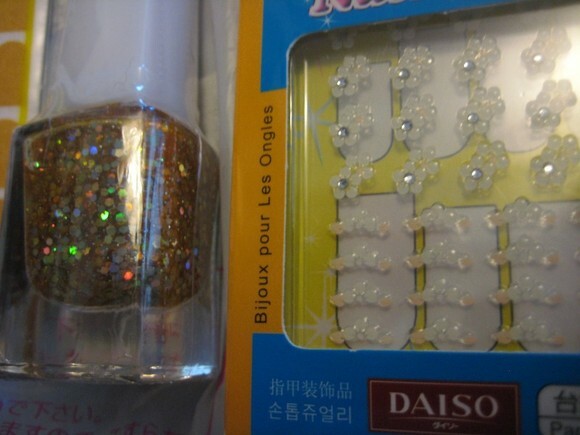 Yeah, definitely try the Daiso nails stickers. Don't forgot to look through the entire rack for different designs because there are various designs mixed up on the same row. Gift Bag items from sponsors!